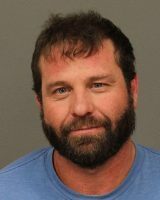 A Creston man who allegedly caused a crash that sent a vehicle off the side of Highway 101 in Atascadero Wednesday morning exited his truck and fled the scene by foot, but he left behind his ID, laptop and other personal items, according to the CHP. At about 9:09 a.m., Richard Jennings, 48, of Atascadero was driving a Toyota Tacoma northbound on Highway 101 at about 50 mph. Jennings was planning to exit the highway at Traffic Way, officers said. Meanwhile, Richard Lawrence Gonzalez, 39, made an unsafe lane change and his Ford truck collided with the right side of Jennings’ Tacoma. The Tacoma spun out of control and veered off the highway, driving through a perimeter fence and and striking a large oak tree. The Tacoma finally came to rest in the Denny’s parking lot on El Camino Real. Witnesses said Gonzalez pulled over on the Traffic Way off-ramp and exited his pickup. The Creston man took all of the vehicle’s paperwork out of the pickup’s glove box and fled by foot off the highway and over a perimeter fence toward El Camino Real. Gonzalez left behind a California photo ID, a laptop and other items containing his full name, date of birth and home address. Officers arrived at the scene and impounded the truck as evidence but failed to locate Gonzalez. Officers describe Gonzalez as weighing about 200 pounds and wearing dark clothing. Investigators are seeking the public’s help in locating him. Anyone who knows Gonzalez’s whereabouts is asked to contact the Templeton CHP office at (805) 434-1822. Gonzalez can also call the Templeton office if he wants to turn himself in. Jennings was taken to Twin Cities Community Hospital with moderate injuries.